Of course there are exceptions. Like the 70-something woman who came to my booth at Antique Alley and told me, “You can never wear too many bracelets!” I really wish I had taken a picture of HER arm party! Mixing silver, brass, and pewter – old and new. One of a kind bracelets. Contact me for availability. It’s a known design rule that odd numbers are more appealing to the human eye. Sometimes known as the “Rule of Three” or the “Rule of Thirds.” For work and/or church I usually stick with three bracelets. But on “just for fun” days, wear any amount as long as it’s an odd number. I know this will be hard for many of you… and you won’t hurt my feelings if you decide to skip this one. I have lots of favorite jewelry and it’s not all the same metal. 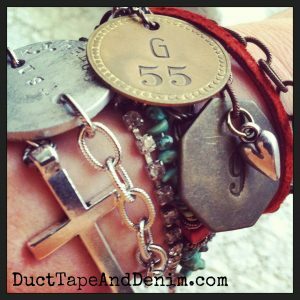 When you mix types of metal in your arm party it makes wearing more than one metal look intentional. Start with 3, each one a different style from the list below. Notice in the photo below there is one thin leather, one chain, one bead, one misc, and a bangle. From left to right: Vintage Tape Measure Bracelet; red leather (handmade by me); Sideways Cross Bracelet; Genuine Arizona Turquoise Nugget Bracelet; the silver chain again that I’m testing out before I use it in my designs. Whether it’s a sterling silver Tiffany eternity bracelet or a pony bead bracelet that your niece made for you, add them both to your arm party and remember the people that gave them to you! From right to left: a multi-chain bracelet I made for myself using leftover chains; GRATITUDE hand-stamped cuff; silver/diamond bracelet given to me by a friend; pearl stretch bracelet with vintage bow charm and bead. After giving you all those guidelines I want to go back and give you my NUMBER ONE fashion rule… “WEAR WHAT YOU LIKE.” I’m not really one to follow many fashion rules but I think if you’re comfortable and like what you’re wearing that makes all the difference. 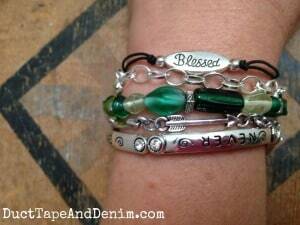 This arm party was a fun combination of seven bracelets. 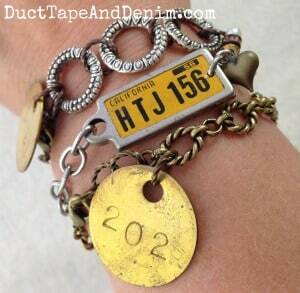 Five were one-of-a-kind vintage repurposed rhinestone and dog tag bracelets. 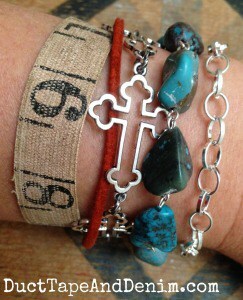 The antiqued brass sideways cross bracelet and the olive wood bead bracelet are both available in my Etsy shop. Now throw yourself an Arm Party & tag me on Instagram so I can see it! 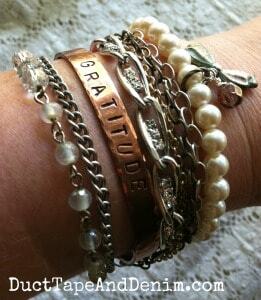 Follow my Arm Party board on Pinterest to see LOTS more examples (both good and bad). 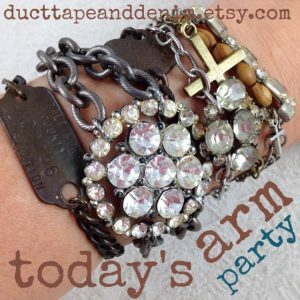 An example of a simple arm party that could be worn to work or church. 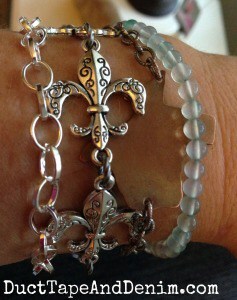 From left to right: simple silver chain; Fleur de Lis Bracelet; Simple Texas Bracelet; tiny glass bead bracelet made by me. BTW, Happy Canadian Thanksgiving!!! This starts my own personal thanksgiving season but I’ll be celebrating the 30 Days of Thanksgiving (#30DoT) on the blog and social media in November. I’ll also have a few spaces open for guest bloggers so send me a message if you’d like to participate. 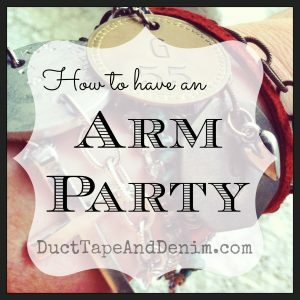 First of all , I love your suggestions for an “Arm Party” I have my jewelry in stores and salons, but the idea of having a party sounds like great fun to me. I have had people buy some of my pieces right off my arm! !